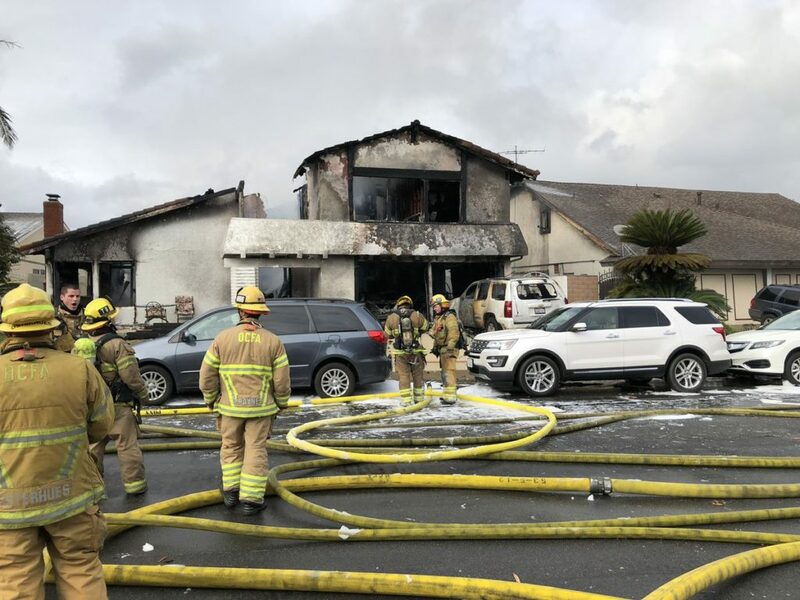 The pilot who died when his Cessna airplane broke apart and crashed into a Yorba Linda home Sunday, also killing four people inside the home, was a 75-year-old retired Chicago-area police officer and restaurant owner in Carson City, Nevada, officials said Monday. The plane nose-dived onto the 19000 block of Crestknoll Drive at about 1:45 p.m., Orange County Sheriff’s Department spokeswoman Carrie Braun said. The 1981 twin-engine Cessna 414A took off from Fullerton Municipal Airport about 10 minutes before the crash, according to National Transportation Safety Board Investigator Eliott Simpson. The pilot was identified as 75-year-old Antonio Pastini of Gardnerville, Nevada. An employee at his restaurant, Kim Lee’s Japanese Restaurant and Sushi Bar, declined to comment, citing the wishes of the family. Chicago Police Department officials say they have no record of Pastini working for the force there, but Orange County sheriff’s deputies found a Chicago Police Department badge and retirement papers on him, Braun said. Radar data indicate the plane made a left turn and climbed 7,800 feet before crashing into the house, leaving the cabin in a ravine behind the house and debris scattered over four blocks, Simpson said. No information is available yet regarding why the plane crashed, Orange County Fire Authority Capt. Cameron Rossman said. Pastini was flying solo. Two males and two females were killed inside the house, Orange County Sheriff’s Lt. Cory Martino said, but their names were withheld pending notification of next of kin. Two injured victims were hospitalized with burn injuries. Their conditions were unknown. In video footage shot by witnesses and given to ABC7, a two-story home is shown engulfed in flames and a piece of the plane’s wreckage is burning in the street. NTSB investigator Maja Smith told reporters that many witnesses saw the plane’s wings fall off before it crashed. NTSB investigators expected to spend Monday gathering evidence and picking up the pieces of the aircraft before it is taken to a storage facility in Phoenix, Simpson said. A preliminary crash report will be available in 10-14 days, he said. Nearby Glenknoll Elementary school, at 6361 Glenknoll Dr., was closed Monday for the investigation, authorities said. On Pastini’s Facebook account on Jan. 27, he discussed his volunteer work with Angel Flight, which provides airplane rides for the needy to get to doctor appointments.